When it comes to painting your home or any projects you have, nothing can just beat the convenience that HVLP paint sprayers bring. HVLP or High Volume Low-Pressure paint sprayers allow anyone to paint with precision and cleanliness. But of course, you will realise along the way that only the best HVLP spray gun can give you the most polished results. Technically speaking, HVLP devices differ from the conventional paint sprayers. Specifically, the latter is using a compressor to generate pressure for it to operate. Of course, such mechanism is essential in making the paint fine. However, they are susceptible on over spraying, which is not a good thing. First, it is a waste of paint. Second, it is harmful to the environment. Lastly, it would affect the overall result of the paint job. Fortunately, the options you have for an HVLP paint sprayer are not limited. The market has a vast repository for this simple painting tool. But in this article, we only feature those HVLP paint guns that have the highest recommendation from professional contractors and DIY community. It will give you a head start in your selection process. Know them now! There are certain factors that you should consider whenever you are going to buy an HVLP paint sprayer. Of course, you need to take these considerations into account, especially if you want a tool that can do the job well. The safety of an HVLP paint gun is dependent on several factors. 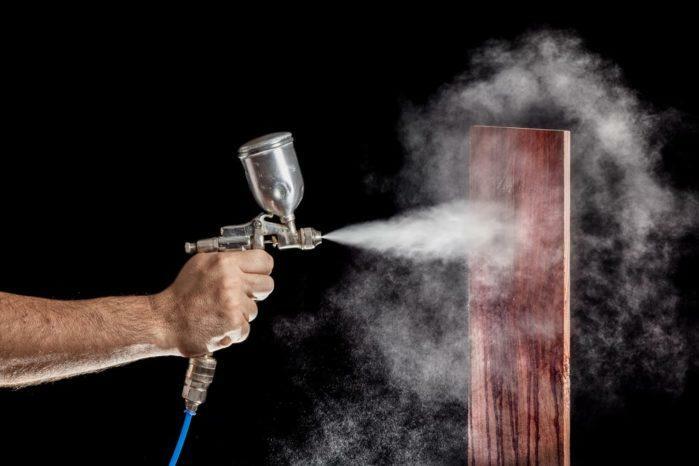 First, you should know how a paint gun is using a spray cup to hold varnish, lacquer, stain, and paint. Meanwhile, it is the nozzle of the device that sprays out the material. Of course, you should inspect these two components by yourself. You need to assess if the cup can hold the ideal amount of paint that you want to use. On the other hand, the nozzle should be efficient enough to prevent over spraying. Moreover, the spray gun should be versatile of some sort. After all, some workpieces will require you to spray at different angles. For instance, painting furniture and other highly-detailed tasks demand the flexibility of the paint sprayer. Therefore, it would be great if you have a paint sprayer that has a pre-preparation feature that enables you to set it up for various spraying angles. Most of the high-end HVLP paint sprayers come with "stages." Notably, this feature indicates that the HVLP spray has a turbine which allows the motor to run at various speeds. For example, a 2-stage HVLP spray gun means that you can operate it two-speed setting. There are different ways to adjust and modify the rate of the spray. Sometimes, the nozzle is the one that controls it. But for some other models, there is a separate dial or knob dedicated for such feature. Another important feature that you should look for an HVLP spray gun is a bleeder. 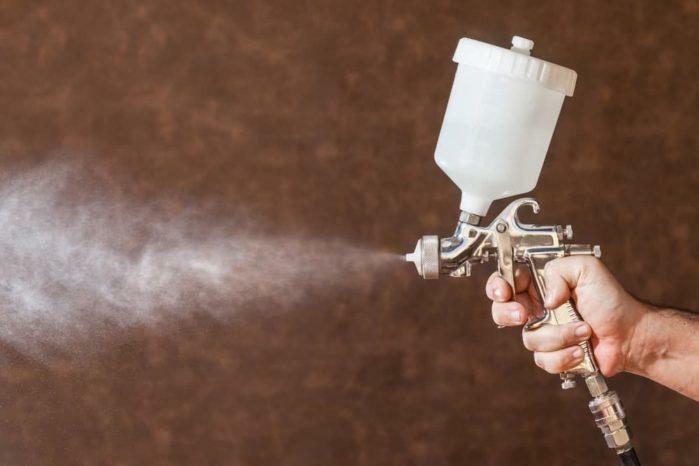 The conventional paint sprayer is usually susceptible to air loss at the nozzle, especially if you are not pressing the trigger of the tool. The presence of the bleeder solves this problem. Specifically, this part is the one that supplies the nozzle with air. Moreover, it also minimises paint splatters when you are working. Of course, the price sometimes dictates the quality of the HVLP spray gun. You can easily assume that high-end HVLP sprayers have better performance and features compared to their entry-grade counterparts. It is crucial to pick these premium spray guns especially if you are usually working with large applications. Moreover, if you are a professional contractor, then it is mandatory that you should get a comprehensive system. However, even the simplest DIYer can still opt to invest on expensive models. For those who just want to have a reliable painting amenity, then entry-grade spray guns are already an acceptable choice. There is no need for you to get a costly HVLP spray gun if your intended application is simple. The Efficiency of Paint Transfer - The utilisation of low pressure reduces the viscosity of the paint. Therefore, it lessens the occurrence of colour fog which is pretty prevalent if you are using high-pressure paint sprayers. It is Safe - Because you are using a comprehensive and technologically-advanced painting system, you reduce the chances of working accidents. Maintenance - It is undeniable that HVLP paint sprayers have low maintenance requirements. It is IN contrast with airless systems, which requires you to maintain them from time to time. Maximum Control - You can easily control the amount of paint being sprayed by an HVLP paint gun. It allows you to accommodate various painting tasks. You could also modify the angle of the spray if your unit provides such feature. The Speed - It is notable that the working pace of an HVLP paint sprayer is quite slow. That is due to the low atomization rate of this device. After all, it is using a low-pressure mechanism, so you have to expect this drawback. If you are quite in a rush, you might now want to use this type of paint sprayer. Viscosity Issues - Another thing that you should know is that HVLP paint guns are not the best option for handling materials that have high viscosity. Again, this is due to its inherent low pressure. But overall, an HVLP paint sprayer is an excellent tool for home renovations, woodworking projects, and other related applications. If you are eager to know the top options for this device, better hop on to the next section. One of the best in the field right now is the Fuji 2202 Semi-PRO 2 HVLP Spray System. It is an excellent tool that is perfect for both DIY and professional applications. Today, it is among the few HVLP paint sprayers that offer robust two-stage painting system. As a result, you can adjust the amount of colour that it releases to cater various working requirements. Another great feature that the Fuji 2202 provides is its anti-bleeding system. Because of this component, you can guarantee that this tool can work seamlessly. Moreover, we also noticed that it doesn't produce splatters, which is impressive. Meanwhile, its fan control knob enables you to modify the size of the spray pattern. In this way, you can paint different workpieces conveniently. A metallic case ensconces the Fuji 2202 sports a 1400-watt bypass motor. This engine is compatible with various types of coating. With this, your versatility in the field is never limited. It also comes with a comfortable and slip-free gun holder for better handling. The Neiko 31215A HVLP Gravity Feed Air Spray Gun is an exceptional tool that any professional and DIYer can use. It is available in various models (vary on nozzle sizes), which is ideal for those who are quite particular about the size of spray. It is a great paint gun that displays stability and flexibility when operating. One of the selling points of this tool is its heavy-duty construction. Most of the parts come with stainless steel and brass. Therefore, you can guarantee that this device can last long in the field. It is also utilising the traditional HVLP fluid delivery system for improved paint flow. The feature complements by the valve knobs which you can adjust to enhance the precision of your output. The Neiko 31215A is a complete package. It has a wrench and cleaning brush that you can use for maintenance purposes. Overall, this particular HVLP sprayer is of for household and automotive painting tasks. It is undeniable that the Wagner FLEXiO 890 Sprayer is among the most modern HVLP paint sprayers today. Many professional contractors are using this tool for both outdoor and indoor application. It has some nice features; too, that makes it an outstanding option for anyone. This tool features a patented spray nozzle that improves its overall paint coverage, especially if you are using unthinned paints. It also has a separate nozzle that you can use for doing beautiful finishes on your projects. On the other hand, the power this HVLP paint gun is almost unparalleled, thanks to its X-Boost Turbine. This same feature also prevents over spraying and improves the overall adjustability and versatility of this paint gun. It also features the X-Boost Power Box that provides user comfort while reducing fatigue. Specifically, this design removes the weight of the tool away from the floor. The box also provides a safe and durable storage for the paint box whenever you are not using it. If you are looking for an HVLP spray gun package, you might want to try these tools from the TCP Global. Specifically, it comes with three HVLP spray guns. There is one for primer, another one for the topcoat, and a unit for touch up. If you are not bothered with using multiple spray guns in your project, you better get this option. Each of the spray guns has aluminium cups that have two-liter capacity. They have protective lids to ensure that the paint won't spill out. Meanwhile, the locking air pressure regulator improves the adjustability and functionality of this tool. It prevents over spraying while maintaining broad spray coverage. It is a great set that could work for any DIYers out there. The Graco-Sharpe Paint Spray Gun is a great option for those who are quite tight on budget. It has a noticeable compact size (the smallest among this group). This particular feature allows the tool to be lightweight and easy to manoeuvre. Even if you use it for a long time, you won't feel any fatigue or stress. Despite its size and price, it is quite surprising that the Graco-Sharpe 288878 has a decent performance. It still comes with adjustable features such as on its air pressure and spray pattern. Of course, you should already expect that is spray coverage is not that broad. But definitely, this tool is perfect for small tasks and projects that require extreme paint precision. The Graco-Sharpe 288878 has a cleaning brush and wrench for cleaning and disassembly process. An HVLP paint gun is an excellent tool for any painting jobs. As long as you have this device, you can easily accomplish various projects with less waste and maximum precision. It is a great investment for homeowners and professional contractors alike. Among these units that we featured, we have to say that t﻿he Fuji 2202 Semi-PRO 2 is the best HVLP spray gun. It is a certified tool that many professionals are using. Albeit this fact, this paint sprayer is still easy to use. That makes it a great option for ordinary DIYers, too. It a smooth and stable performance, which guarantee the success of any painting task that you are doing. But of course, you still have the final say for this. Therefore, it would be great if you will check all these options first before deciding. In this way, you can get a paint sprayer that suits your needs and preferences! Do you have any questions, comments, and suggestions? Just ask us. We love to hear from you! 5 of the Best Dado Blades for the Serious Woodworker!